When students look at advertisements, they should be thinking about the questions that remain unanswered. Ads are often convincing to students and they need to be taught to be wary and ask the questions that aren't answered in the ads. 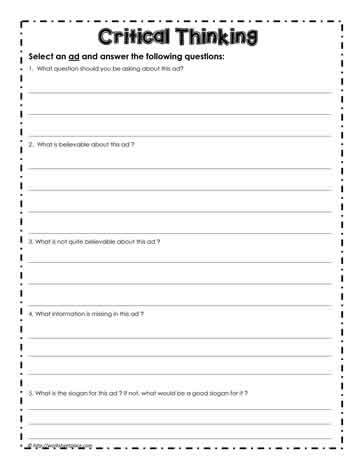 This media literacy worksheet helps develop critical literacy. Students can select their own ads to complete the media worksheet or one can be selected for the entire class. This is also a great homework assignment. Have students fill in the critical thinking worksheet for 2 or 3 commercials they see on TV.